With age comes wisdom. 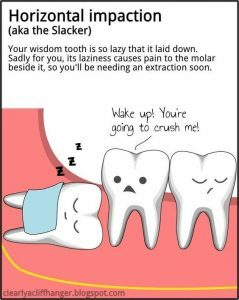 Specifically, wisdom teeth, which typically appear between the ages of 17 and 21 and are referred to as your third molars. Historically, these teeth have been called wisdom teeth because they come through at a more “mature” age. When they come through correctly, healthy wisdom teeth can help you chew. It’s normal to feel a little discomfort when your wisdom teeth appear, but if you have pain, see your dentist immediately. Wisdom teeth can lead to problems if there isn’t enough space for them to surface or they come through in the wrong position. If your dentist says your wisdom teeth are impacted, he or she means they are trapped in your jaw or under your gums. If you have concerns about your wisdom teeth or want additional information regarding our staff/services, give us a call 910/799-9059 or visit us at Burns Family Dentistry!